River States Conference commissioner Michael Schell presents Rio Grande junior Chanavier Robinson with the RSC Women’s Indoor Track & Field Newcomer of the Year Award at the close of Friday’s RSC Indoor Track & Field Championships in Tiffin, Ohio. 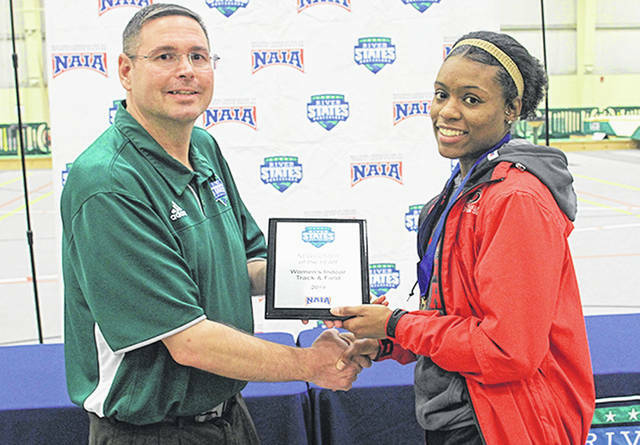 River States Conference Commissioner Michael Schell presents Rio Grande freshman Beyonce Bobbit with the Women’s Indoor Field Athlete of the Year award at the conclusion of last Friday’s Indoor Track and Field Championships in Tiffin, Ohio. Bobbitt was named RSC Women’s Indoor Field Athlete of the Week Monday night. 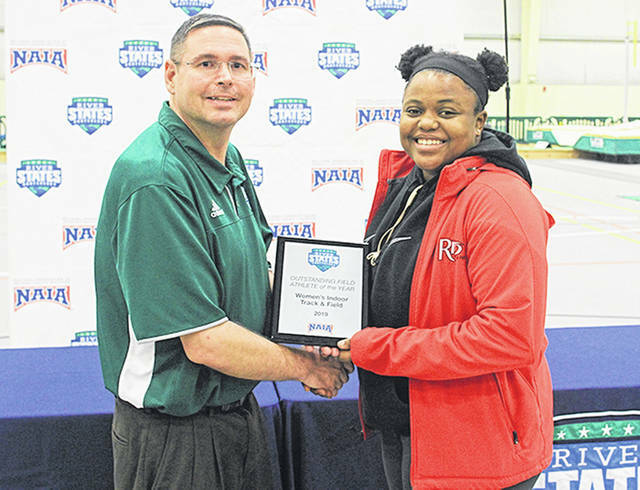 TIFFIN, Ohio — Chanavier Robinson had two of the University of Rio Grande’s five first-place finishes and the RedStorm finished second as a team in Friday’s River States Conference Women’s Indoor Track & Field Championships hosted at Tiffin University’s Heminger Center. Robinson, a junior from Ravenna, Ohio, took first place in both the 60-meter dash (7.83) and the long jump (5.16m), while finishing third in the 200-meter dash with a time of 26.56 and placing seventh in the triple jump with a leap of 8.94m. Robinson’s 28 points scored were enough to earn Newcomer of the Year honors. Her time in the 60-meter dash was one of 11 new meet records established. Rio also received first place outings from sophomore Amirah Strauther (Pickerington, OH), who won the 60-meter hurdles in a time of 9.11; senior Taylor Grubb (Thornville, OH), who took first in the 3,000-meter race walk after crossing in 23:43.01; and freshman Beyonce Bobbitt (West Milton, OH), who won the weight throw with a heave of 14.30m. The winning marks from Strauther, Grubb and Bobbitt were among the new meet records that were set. Bobbitt also finished as the runner-up in the shot put with a toss covering 11.42m and earned Field Athlete of the Year honors. Rio Grande totaled 130 points as a team to finish behind repeat champion Point Park University’s 158-point total. Cincinnati Christian University took third with 112. Point Park’s Anna Shields was named RSC Indoor Track Athlete of the Year. She piled up a meet-high 42.5 points by winning four individual events – the 600-meter run, the 1,000-meter run, the one-mile run and the 3,000-meter run – while also anchoring the Pioneers’ 4×400 relay team. Point Park’s Kelly Parsley won his second straight Coach of the Year award. Rio Grande had 12 other point-scoring individual performances and three relay units that contributed to the overall runner-up showing. The RedStorm’s other top individual showings included senior Lucy Williams (Athens, OH), who was second in the 3,000-meter run with a time of 10:44.95; freshman Sierra Cress (Greenville, OH), who was second in the weight throw with an effort of 13.37m and fourth in the shot put with a toss of 11.16m; junior Natalie Seeberg (Urbana, OH), who was third in the weight throw with a heave of 12.58m and eighth in the shot put with a toss of 10.30m; freshman Chase Davis (Huntington, WV), who was fourth in the long jump with a leap of 4.69m; Strauther, who was fifth in the high jump after clearing 1.40m; sophomore Rachael Barber (Ashland, KY), who was fifth in the 60-meter dash with a time of 8.16 and seventh in the 200-meter dash after crossing in 27.52 seconds; junior Kelsey Miller (Georgetown, OH), who was fifth in the 3,000-meter race walk with a time of 30:14.88; sophomore Taylor Tackett (Hillsboro, OH), who was fifth in the 600-meter run in a finish of 1:47.83; and senior Alexis Johnson-Schoolcraft (Mercerville, OH), who was eighth in the weight throw with a toss of 10.77m. Rio’s 4,000-meter Distance Medley Relay team – comprised of Miller, freshman Abilena Sullivan (Chillicothe, OH), Grubb and Williams – placed third in a time of 14:02.45, while the RedStorm’s 4×400 relay unit – featuring Barber, freshman Sarah Shephard (Carroll, OH), sophomore Ambar Torres (Guyaquil, Ecuador) and Tackett – was fifth with a mark of 4:48.00. The 4×800 relay squad, which was composed of Sullivan, Grubb, Miller and Williams, also placed fifth in a time of 11:02.75. Rio Grande will return to action on Sat., Feb. 16 with some athletes competing at Findlay University and others participating at Kent State University. NOTE: University of Rio Grande freshman Beyonce Bobbitt was chosen as the RSC Women’s Indoor Field Athlete of the Week for Feb. 4-10. Bobbitt scored 18 points in the throws to earn River States Conference Women’s Indoor Field Athlete of the Year last Friday at the RSC Indoor Track & Field Championships. A native of West Milton, Ohio, Bobbitt won the conference title in the weight throw with a heave of 14.30m for a new meet record. She also placed second in the shot put with a toss covering 11.42m.